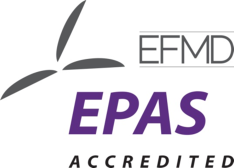 In 2013 the Bachelor’s programme International Business Administration and Master’s programme Business Administration received the EPAS accreditation. We have received this accreditation for our international perspective and high quality of our programmes, granted by the international programme accreditation system EFMD. Programme director Tanya Bondarouk is very satisfied with the achieved accreditation. “We have worked hard on our international focus in the past years, and this is a confirmation that we are on the right track. Our aim for the coming years is to extend our international context, giving students the opportunity to expand their international experiences. By working in multicultural teams and doing projects with international themes and internships our students are prepared for a promising international career".